The long taper of the nickel silver rear bolster and the slim build of this pocket knife take you back to the days of dueling pistols, but the purpose of this gentleman's accessory is more civilized. The sleek Texas Toothpick, folded to three inches long, fits in the pocket neatly but still offers a reliable grip and enough narrow clip point blade for everyday chores and minor emergencies. Be careful with the Toothpick, because even though the slender point seems perfectly made for piercing, this is the older slip-joint style. The blade snaps into open position, but pressure on the spine of the blade closes the knife. Although the blade doesn't lock open, that doesn't deter careful owners from repairing the occasional belt or boot. 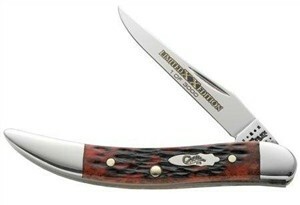 Case produced only 3,000 of the Texas Toothpick in the limited edition crimson bone pattern. Released in August 2010, the series includes seven other popular Case styles. All use natural bone handle slabs harvested from Brazilian range-fed Zebu cattle. According to Case, the shin bones of the Zebu provide the densest bone available today. Engraving on the blade marks each individual knife's numbered place in the series. Save this fine collectible for the desk and buy the Old Red Bone Texas Toothpick for everyday uses.